Why Doesn't the International Space Station Have a Name? The International Space Station is primarily a science laboratory in space. NASA would like to invest in ventures beyond Earth orbit, but industry leaders fear what will happen if the agency pulls out its investment in the station before a commercial options is available. The largest and most expensive structure ever built in space is still waiting for a name. The International Space Station, a $100 billion project of 15 nations, often is called simply "station" or "ISS" by NASA flight controllers. 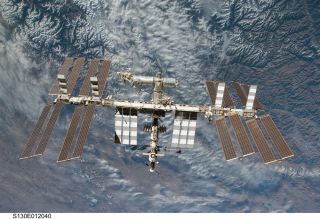 "We started talking years ago about naming ISS," Mike Suffredini, NASA's International Space Station program manager, told SPACE.com. "You know, we've been busy building it. We haven’t been worrying about what we're going to call it." During the first mission to the station, Expedition 1, NASA astronaut Bill Shepherd used the call sign "Alpha" to refer to the facility. The name has been used informally off and on over subsequent missions. "Now is about the time that I would guess it might surface back again and we might start thinking, what do we want to call this thing?" Suffredini said. But the decision will be complicated, as it must be agreed on by all the space station's international partners: Russia, Canada, Japan and Europe. Previous space stations have been named by the nations that built them, such as Russia's Space Station Mir and NASA's Skylab orbiting lab. China has named the first module of its space station Tiangong-1 ("Heavenly Palace"). Yet a formal name for the International Space Station remains elusive. "It really is a partnership decision," Suffredini said. "We can't just go name things." The focus is on the International Space Station now that NASA's 30-year space shuttle program is done. The last space shuttle landed July 21, capping off the STS-135 mission and the 134 previous shuttle missions that came before it. The station is home to a rotating crew of six. Even though space shuttles will no longer be transporting astronauts there, U.S. astronauts will rent seats on Russia's Soyuz spacecraft, until commercial American vehicles are ready to carry them. The American portions of the International Space Station have been designated a U.S. National Laboratory, and NASA has hired an independent nonprofit to manage the research that goes on inside them. The agency wants to encourage NASA scientists, as well as non-NASA researchers and industry, to use the space station to conduct experiments that capitalize on the microgravity environment. Fields such as biological science, materials research, crystal growth, vaccine development and more are fertile ground for weightless projects, NASA officials say. Sounds like the kind of enterprise that could use a name.